We carry a full line of sparring gear including name brands and full sets. We have the lastest gear from Adidas and Macho, some of the biggest brands on the market. We also carry Golden Tiger and cloth gear. 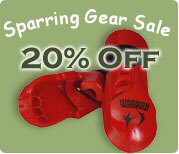 From karate to tae kwon do sparring gear we have what you need to keep you protected.